This is a business case from a customer using our Shipping Plugin. He wants to offer flat rate or free shipping option in the shop front end and use our ELEX WooCommerce DHL Express / eCommerce / Paket Shipping Plugin with Print Label plugin to generate the labels. And all our shipping plugins require the products in the shop to have weight and dimensions in them. But this customer haven’t added the weight and dimensions initially and he has about 1000 products in shop. To add weight and dimensions to all 1000 products will take a lot of time. But the plugin will not work without adding weight and dimension to the products. How can we solve this? In this article we’ll discuss how we can add weight and dimension in bulk and how to offer flat rate and free shipping in the shop front end. It is always good to add weight and dimensions to all products while you create them so that you don’t face this type of issue later. Most shipping plugins require weight and dimension for shipment cost calculation and for packing them into boxes. And also for international shipment, it’s necessary that we declare each and every product in the package, so the API of the shipping carriers make it mandatory that we provide the weight and dimensions of the products as well in the customs information. So the more accurate weight and dimension of the product we provide, the better. This solution should work for all our shipping plugins but here in this article we’ll take DHL as an example plugin for set up and configuration. But this solution will only work if all products have similar weight and dimension or if the products are not being shipped to international addresses. If you’re shipping to International address the custom information need to match the final package weight and dimension, If the customs information says the products inside the package weighs 1 kg but the package weight is 5 kg, that will raise suspicion and might be flagged and might not reach the delivery address. But if you provide weight close to the actual product weight then it will work fine. Since we’re taking DHL plugin as an example for this article you’ll have to download and install the plugin first. You need to purchase the plugin from our site, and set up the plugin to get the shipping rates. To set up the DHL plugin and retrieve the shipping rates, you need to get the API credentials from DHL team. For DHL Express, you need to open account and register in https://xmlportal.dhl.com and DHL will provide the Test and Live API credentials. Depending on which set of credentials you received you need to enable/disable the ‘Show DHL Account Rates‘ option under the Rates and services tab in the plugin settings. For Test credentials you need to disable the ‘Show DHL Account Rates‘ option, and for live credentials you need to enable the ‘Show DHL Account Rates’ option. 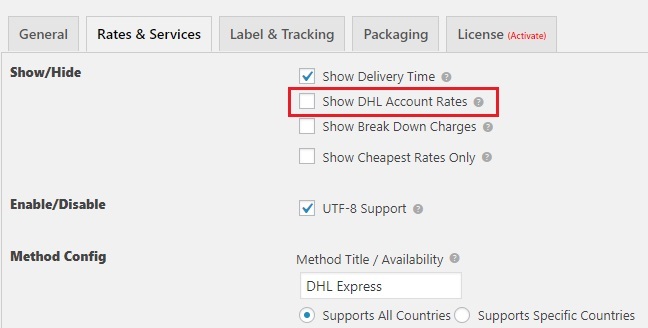 Once done, enable the DHL Express services in the plugin settings under the ‘Rates and Services Tab’ with the product code ‘N’ for Express Domestic, ‘P’ for Express Worldwide, ‘D’ also Express Worldwide (doc type) and U also Express Worldwide (doc type). Different countries require different services, and so depending on the requirement, the API will automatically return rates for one of the above services. Now, check if you’re getting the DHL shipping options in the Cart page. If you’re not getting any shipping rates, please make sure you have the address correct or contact our support team. Note: We need to check if the shipping rates are showing in the cart/checkout page to see if the set up is working fine. Once you’ve confirmed you’re getting the shipping rates in the cart/checkout page you can disable the ‘Real time rates’ option in the plugin settings. Its not necessary that it be flat rate shipping or free shipping. This can also be for some table rate or other carrier’s shipping option you offer in the shop’s front end. But if you’re providing the WooCommerce flat rate or free shipping option, you can set it up in WooCommerce shipping zones > Add shipping method. You can refer to the documentation to get the detailed instruction on how to set up the WooCommerce Flat rate or WooCommerce Free shipping methods. You can use our Bulk Edit plugin ELEX Bulk Edit Products, Prices & Attributes for WooCommerce. It’s an efficient way to add weight and dimension to the products since you can filter the products by the attributes or categories, and so many other filter options. Once the product is filtered, you can click on ‘Continue’ and click on ‘Yes, Proceed’ and under the weight and dimensions field, you can add weight and dimension by replacing or adding the values. This update should work fine for the DHL plugin and our other shipping plugins. If you want to give all products the same weight and dimensions, you can filter for all products and update. But if you want to give more accurate weight and dimension you can filter for specific product as well to update by weight and dimension, you can even exclude products by the product ID while filtering in case you don’t want to update the weight and dimension in the filtered products. If you need more detailed guide on how to use the Bulk Edit plugin you can check our documentation How to set up ELEX Bulk Edit Products, Prices & Attributes for WooCommerce plugin? Once the products’ weight and dimension is updated, the Create shipment button should work fine. You can try place an order, and then go to WooCommerce Orders > open one of the orders > Find the Shipping plugin’s widget and click on Generate packages > Create shipment. Make sure the ‘Ship to’ address is valid and you get the services to choose before creating shipment (applicable to DHL plugin). If you’re not getting any services; that means there are some issues with the product data, or the address is invalid. 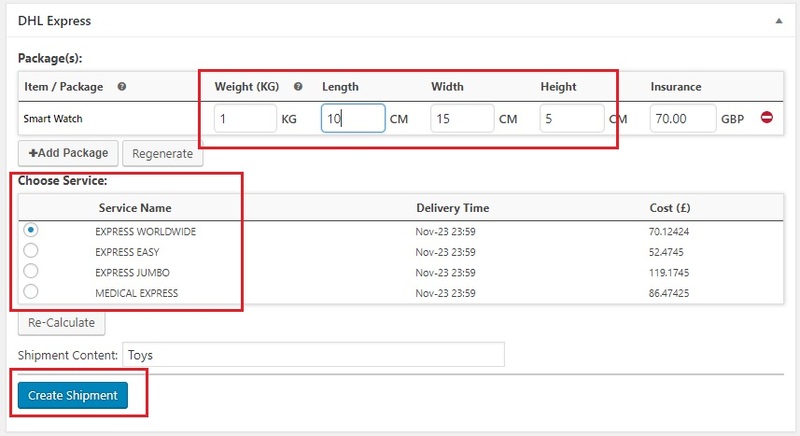 If you had given inaccurate weight and dimension to the products and need to edit them before creating shipment, you can do so in the package weight and dimension field and click on the Create shipment button directly. But make sure the edited weight is not lesser than the product weight you have provided, else it will give an error. Hope this article helped with your requirements with the shipping and also in adding weight and dimension to your products. Do let us know if you have any issues or requirements with our plugins. Or if you have any business case that requires some solution by our team you can leave a comment in this article. We’d be happy to help.